Mary Poppins got it right: a spoonful of sugar helps the medicine go down. Gummi candy infused with Vitamin C was originally marketed to please picky children. Now it seems adults too like a little sugarcoating on their supplements. Probiotic gummies have arrived in a big way—a loop around last month’s Natural Foods Product Expo in California confirms it. The last five years have shown positive growth in the probiotics gummies market according to research supplied by Business Services News. And the forecast looks bright with continuing growth into 2023 and beyond. 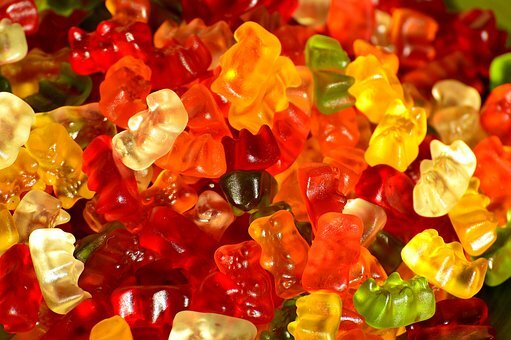 The gummy bear originated in Germany, where it is popular under the name Gummibär. Enamored with the trained bears which were widespread attractions at 19th century street festivals, Hans Riegel Sr invented the candy in 1922 and sold them through his company called Haribo. Wildly popular, the confection inspired a 1985 animated series called Disney’s Adventures of the Gummi Bears. The word “gummi” resulted from gum arabic used as the original base ingredient and not because the candy sticks to our gums. Gummy bears are made from a mixture of sugar, glucose syrup, starch, flavoring, food coloring, citric acid, and gelatin. Recipes will vary such as for organic candy, those suitable for vegetarians, or those following religious dietary laws. Thus, even though obesity is epidemic—40%, a new high in the United States—many are malnourished due to the empty calorie intake. In addition, diabetes and its resultant insulin resistance is exacerbated by excess refined sugars. Another problem caused by sugar is tooth decay, especially true with sticky forms such as gummies. And finally, gelatin in most gummy bears may harbor prions, some which may cause bovine spongiform encephalopathy (BSE) in cattle though the risk is thought to be low. So, is it a good idea to promote candy as a vehicle for delivery of probiotics?